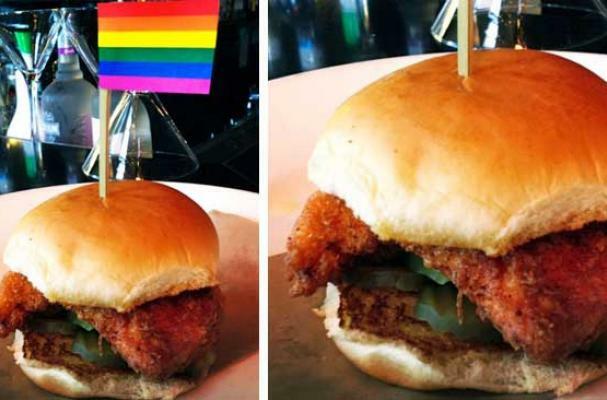 The Chick-For-Gay Sandwich is a pro-LGBT chicken sandwich. Made by West Hollywood's The Abbey, widely considered the best gay bar around, the sandwich is a blow against Chick-fil-A's donations to known advocates against marriage equality rights. The Chick-For-Gay sandwich is essentially the same recipe as Chick-fil-A's own chicken sandwich. The Abbey plans to donate 100 percent of the sales to the American Foundation for Equal Rights. This isn't the first stand against Chick-fil-A's stance on gay marriage; actor Ed Helms made it known via Twitter that he was boycotting the fast food joint.